Sounds incredible…right? How can one visit seven world heritage sites in 4 days or less? Well I don’t have an offer that you can’t refuse as Don Corleone had but I definitely have an audacious world heritage trail plan that could enable anyone to visit seven world heritage sites in 4 days or less. But to do that there are some conditions which must be fulfilled. So which are these eight World Heritage Sites as inscribed in USESCO’s List am I talking about? Started for Agra in the early morning visited Taj Mahal and followed it up with Agra Fort and returned to Delhi in the night. Started early morning from Delhi and visited Neemraana first and followed it up with Amber Fort, City Palace, Hawa Mahal, Jantar Mantar and Chokhi Dhani and came back to Delhi the same night. But this trip of mine was more like touch and go which I would never recommend. So what’s the “Nine World Heritage Sites you could visit in 4 Days or Less” itinerary do I have in mind! It starts – ideally – from Delhi. Day 1: I’ll start with morning at Qutb Minar Complex which is a must visit place in Delhi. This is the site from where the recent history of Delhi begun as we know it. Qutb Minar was earlier the site of the Rajput Tomar kings. Later it was conquered by the Chauhan Rajputs and the last Hindu ruler of what come to be known as Qila Rai Pithora was legendary Prithvi Raj Chauhan. Prithvi Raj Chauhan is a legend in India’s courtly love tradition. He is chivalry personified so much so that it proved to be his doom. He let go of Mohammad Ghauri in the first Battle of Tarain and was subsequently defeated and killed by Ghauri during Second Battle of Tarain. Mohammad of Ghaur left his slave general Qutb Din AIbak to consolidate his victory in Delhi and returned to Khor?s?n. He was assassinated during his evening prayer in Damik (modern day Pakistan) and his slave declared himself the first Sultan of Delhi. Qutb Minar Complex is a wonder and if you take the adjacent Mehrauli Archaeological Park into consideration then it’s a treasure trove indeed – of rich heritage, history and medieval archaeology dating from Sultanate to Mughal Empire. Inside the Qutb Minar Complex, the structures of note include the Qutub Minar, Tomb of Shams-ud-Din Iltutmish, the unfinished Alai Minar, Tomb of Imam Jamin, Alaudin Khilji’s Tomb – who founded second city of Delhi names Siri – and Madarsa, Quwwat-ul-Islam Mosque and the Iron Pillar in the centre of the congregational hall of the mosque. After Qutb Minar, the next World Heritage Site in Delhi that I’d recommend is the Red Fort. Red Fort is one of the most culturally significant structures In Delhi. It was built by Shah Jahan and named Shahjahanabad. It is now mostly in dilapidated state as it was ransacked and looted by British during the first war of independence or what is known as Sepoy Mutiny of 1857. There are several awesome sights including Mumtaj Mahal Palace which is now a converted museum displaying Mughal artefacts and wares. Structures of note include Diwan-i-Aam, Diwan-i-Khas, Moti Masjid, Nahr-i-Behist and several Hamams & Pavillions. It will take approx 2 hours or even more to visit each and every structure inside the Red Fort Complex. Besides there’s a baoli and Salimgarh fort adjacent to Red Fort which are of particular interest and you should visit them if you are into history, architecture or photography. The next World Heritage Site to visit today is Humayun’s Tomb. It is one of the best preserved and magnificent historical structures in Delhi. It also happens to be one of the first Char Bagh style mausoleum complexes to be built in India. This form of Indo-Islamic architecture was later perfected during the construction of Taj Mahal in Agra. Although the highlight of the complex is the mausoleum of Humayun ensconced within the charbagh, there are several other monuments that are sprinkled inside. Tomb of Isa Khan Niyazi, an Afghan noble in Sher Shah Suri’s court constructed in 1547 even pre-dates the main tomb itself, by twenty years. This complex is also referred to as the royal burial chamber of the Mughal royalty as the graves of Bega Begum, Hamida Begum, Dara Shikoh, as well as numerous other subsequent Mughals, including Emperor Jahandar Shah, Farrukhsiyar, Rafi Ul-Darjat, Rafi Ud-Daulat and Alamgir II. One of the interesting anecdotes associated with Humayun’s Tomb is about the lattice work of the central mausoleum complex. It is said that when Sher Shah Suri defeated Humayun, captured Purana Quila and while Humayun fled he hid inside a well to escape the soldiers of Suri who were looking out from him. According to the legends, a spider spun a web over the well so that people would think that it was not used for a long time. Seeing the web, soldier didn’t look out for Humayun and that was how he was saved. The intricate lattice screens or the perforated stones (khirkis or jaalis in Hindi) were designed to replicate the spider web which had saved Humayun’s life. BTW, you may also want to know why I love my city. Day 2: The next day I’ll take my bike and ride straight to Agra. You could do so by a car of by Shatabadi Express Train that leaves early morning from Delhi to Agra. Taj Mahal obviously needs no introduction. It’s the largest erection ever by a man created for a woman (the pun is obviously intended). Voted as one of the 7 Modern Wonders of World and inscribed as a UNESCO World Heritage Site. Taj Mahal in Agra is truly a must visit place in one’s lifetime. This gem of a white marble structure is considered to be the only symmetrically flawless architectural construct. Dignitaries, celebrities and royalties from around the world have paid obeisance to this magnificent symbol of love. The best photo ops for Taj Mahal are from the other side of Yamuna River ideally from Mehtab Bagh. From here, the next place to visit in Agra is the Red Fort or the Agra Fort which is also inscribed as a UNESCO World Heritage Site. This fort has a early history and was supposedly built by Rajput rulers. It was later reinforced and extended by Akbar using mostly red sandstone which gives it the name. Later Shah Jahan dismantled many a buildings inside and erected them using white sandstones. It is said it was here that Shah Jahan’s son Aurangzeb improsioned him after he usurped his father and that Shah Jahan was held captive in the chamber which overlooked Taj Mahal where his beloved wife Mumtaj was buried. If you still have time after visiting these two splendid marvels of Mughal Architecture then you should head to the tomb of Itmad-ud-Daulah. This mausoleum was commissioned by Mughal empress Nur Jahan to commemorate her father Mirza Ghiyas Beg, a powerful general during the reign of Jahangir. At the end of the day I’d recommend that you visit Taj Mahal once more to have stunning sunset view when the hues of twilight gives this white wonder an ethereal look. Day 3: Some say you should visit once more and behold Taj Mahal in its morning glory. What would you do? I leave it up to you. 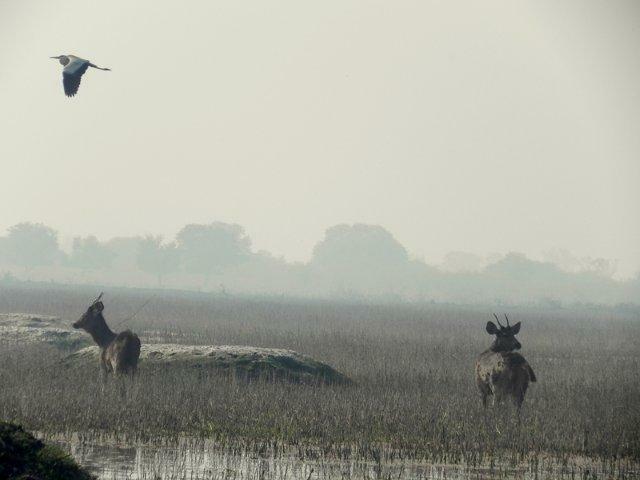 But if I were you I would head early in the morning to Bharatpur Bird Sanctuary also known as Keoladeo Ghana National Park, a UNESCO inscribed World Heritage Site in India. More than 350 bird species have been recorded inside this national park in Rajasthan which include the Sarus Crane and Siberian Crane. My tip is that you hire a bicycle to explore this gem of a place. There are quite a few heritage structures too inside this sprawling wetland which are worth a visit. Destination next is Fatehpur Sikri, yet another World Heritage Site inscribed by UNESCO. This sprawling fort city was built around the abode of the Sufi Saint Seikh Salim Chisti. It is believed that Akbar once visited the saint and wished for a son. It is said that with Saint Salim’s blessings, Akbar was soon granted his wish and a son was born who Akbar named after the saint. We have known of that name from legendary Bollywood Movie Mughal-e-Azam, one of the earliest movies about courtly love tradition in India. Madhubala played the pastoral beauty Anarkali and Dilip Kumar played Salim. Unfortunately those wre not the time when Salim could sing Anarkali disco chali and alas the song Anarkali sang – jab pyar kiya to darna kya – was way ahead of time. So what actually happened was Akbar had Anarkali buried alive inside a wall. Digressions apart, Akbar – when granted his wish – decided to build his capital around the saint’s seat. Even today you’ll see the outstanding white marble tomb of Seikh Salim Chisti inside the fort complex. Fatehpur Sikri was soon abandoned due to lack of water but this now ‘ghost town’ houses an array of awe inspiring structures including the Panch Mahal, Diwan-i-Aam and Diwan-i-Khas. Day 4: After Fatehpur Sikri, there are 2 places that you could head to depending upon the energy you’ve left with and the interest in history and heritage. Sikandra – the Tomb of arguably the greatest Mughal Emperor Akbar – is just a stone throw away from Agra and lies in between Fatehpur Sikri and Agra. If you’re coming from Agra, you’d definitely visit this tomb first if it’s in your plan. One of the reason I love this mausoleum is not that it has brilliant architectural plan – which it does. The reason I recommend this place is that it is inhabited by Blackbucks who frolick inside the lush gardens of the complex in gay abandon. So now we are left with Jaipur. I know you’d be wondering by now that how the hell we do Jaipur in such short time. Jaipur is 220 kilometers from Fatehpur Sikri, roughly 3 hours away. You are tired by now I know. After visiting Fatehpur Sikri and Sikandra but common, we are travelers right. Footloose at best! Fondly referred to as the “Pink City”, Jaipur is one place that you should visit if you are a traveler, Indian or in India. There are forts, palaces, colorful bazaars and then there is Chokhi Dhani. The royalty of Amber – which used to be the capital before it was shifted to the safer City Palace in Jaipur – were close to Mughal and the maharajas served as general in Mughal Army. Due to this cordial relation, the enjoyed many privilege. It also gave them ample opportunity to indulge in their idiosyncrasies and pomp. They built palaces, they were patron of arts, they had private hunting grounds (now Ranthambore National Park) and they built and protected. All this are on display as you travel the nooks and corner of the royal city of Jaipur. There are resplendent fortresses, art galleries, bazaars, folk artists and a sense of history that jostle without a fuss with this modern cosmopolis. The World Heritage Sites in Jaipur include the Jantar Mantar or the Royal Observatory and the recently inscribed Amber Fort, one of the hill forts of Rajasthan. Other places worth a visit include the Nahargarh Fort, Jal Mahal, City Palace and my favourite Chokhi Dhani. 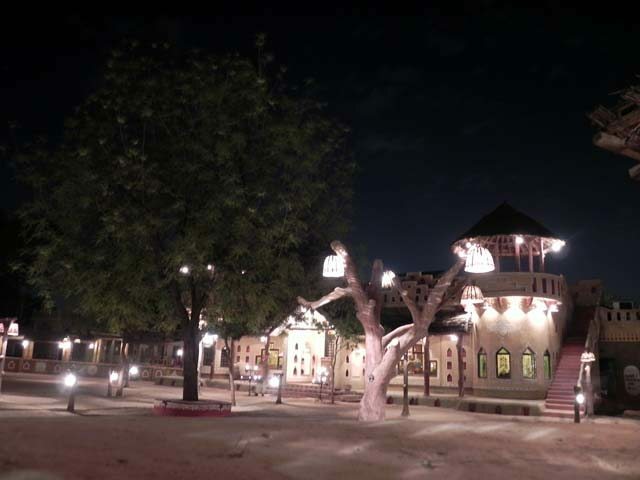 You should ideally visit – as did I – Chokhi Dhani in the evening. It is when the place comes alive with an array of folk performances. This ethnic resort in Jaipur is in actuality a microcosm of what the Rajputana used to be. It recreates or say reprise a bygone era when Rajasthan was ruled by dynasties belonging to various Rajput warrior princes. My favourite recommendation inside Chokhi Dhani is the Puppet Show and the Five Course Mewari Meal which is for free (cost is included in entrance fee). Without being getting carried away, I’d now conclude this post. Let me know your thoughts on this audacious itinerary of mine. Would you like to attempt it? If not…why? If yes…when?